Bright Brewery brews in the heart of one of Victoria's most naturally beautiful regions and now operates both a brewpub and a larger production facility. If you want to sell the brewery's reworked range of beers in Melbourne, currently the team is hiring. Bright Brewery seeks to recruit a Melbourne-based Sales Representative & Brand Ambassador to grow our sales and distribution operation servicing Melbourne and Victoria. We are looking for an experienced sales person with a proven track record in the craft beer industry. The person will have an established network of contacts across major retailers, distributors, independent outlets and venues. The person will act as an ambassador for Bright Brewery’s brand, values and lifestyle. We are looking for someone who can grow with the business. The right person will be rewarded with an attractive package and work life balance. Bright Brewery is a family owned brewery, bar, restaurant and bike hub, located in the heart of Bright, Victoria, which has been established for over 10 years. During this time, Bright Brewery has built a reputation for high quality beer and great customer service culminating in a gold awards at the Victorian Tourism Awards in 2017 and 2018. We have a very strong values-based approach to managing the business. Bright Brewery recently completed a multi-million-dollar investment to increase brewing capacity and has entered the wholesale market. We are AUTHENTIC and genuine in all that we do. We present our business and services truthfully. Our relationships are honest and respectful. We’re passionate about the environment that surrounds us and seek to minimise our impact on it. We’re managing our business for the long-term, providing a viable future for our community, staff and customers. We are active in the community. We continue to review and develop our products and services so they evolve and grow with the market. We are actively managing the business for future success. Drive the wholesale of Bright Brewery beers to bottle-shops, restaurants, bars and venues, and other retail and hospitality outlets across Greater Melbourne. Be an excellent ambassador for Bright Brewery’s brand, values and lifestyle. Achieve budgeted sales targets and KPIs. Identify and capitalise on market opportunities to build sales and profitability. Work autonomously to manage and grow accounts, as well as brand awareness and reputation. Relationship management, including prioritisation of key customers and new customer development. Providing a superior level of service to our customers. Assist with establishing efficient systems and processes for the role. Work with the Logistics Coordinator on ensuring timely and efficient movement of stock. Work with Sales & Marketing team support in growing sales across Victoria. Organise in-store tastings and promotions and point of sale displays. Identify realistic opportunities to increase sales. Activate or host events both on and off premise, including festivals. Engage with and help grow Bright Brewery’s social media audience. Report to Sales & Marketing Manager. 2+ years’ experience in wholesale sales related to craft beer. Proven sales record and ability to manage a territory in a structured and planned manner. Established trade connections and relationships in the Melbourne market. Strong commercial and negotiation background. Understanding of the craft beer market, on-premise and retail trade and trends. Excellent face-to-face and written communication skills. Ability to maintain strong and positive relationships with customers. Ability to identify customer needs and provide solutions. Experience managing participation at events. Ability to effectively prioritise tasks and manage time. Computer and social media savvy (E-mail, MS Word, MS Excel, social networking). Self-motivated, outcomes oriented, person of action. 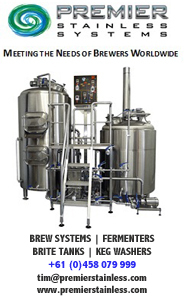 Possess (or have the capability to develop) outstanding knowledge of beer and the brewing process. Process driven with strong attention to detail. Strategic thinking to increase distribution and visibility of Bright Brewery beers. Understanding of Business Finance software, such as Reckon. Understanding of design software, such as Adobe Creative suite. Experience and performance in a similar role. Relationship management and communication skills. Connections to the craft beer industry. Knowledge and passion for beer and brewing. Flexibility with working hours, including readiness to work after hours and on weekend events at events, festivals and brand activations. Commitment to invest time in brand development. True commitment to the role and our business values. A good fit for Bright Brewery’s brand and culture. Please direct all enquiries and applications, including a Cover Letter addressing the Selection Criteria, and a CV to Tom Mullane-Grant (Sales & Marketing Manager) at sales@brightbrewery.com.au.